I have a P3P. Is the Drone supposed to Land in the exact same spot that it took off from when the home button is activated . Or is it more of in close radius of a few feet either way. It's using consumer grade GPS which is only good for a few feet either way. But you don't have to let RTH do the landing. You can cancel at any time and resume control to land where you choose. Thank you for that info. I have a friend that has a Mavic Voom i think the calls it and he said it took off and landed in the same spot so i was thinking something might be wrong with my P3P. I have a friend that has a Mavic Voom i think the calls it and he said it took off and landed in the same spot so i was thinking something might be wrong with my P3P. Newer DJI drones have a feature called Precision Landing that uses the downward sensors to help the drone land more precisely. When following the instructions, those drones are able to land within a few inches of where they took off. Cool if you have a dedicated pad or something similarly identifiable. Probably useless if taking off from a lawn or an empty lot's pavement? Some kind of identifiable object/pattern in the landing is preferred. I did some RTH tests with my Mavic 2 Pro on my asphalt driveway and it was able to land within a few inches without using a landing pad. Color me impressed. I always use RTH to bring it near me and then land manually. Being a few feet out sounds normal and for most my flights, that's enough to land somewhere bad. Because its now winter ... I carry a couple of ceramic floor tiles out to the garden ... makes nice heavy spot for take-off and landing. Yes I can land my P3P on a 12"x10" tile. As M says - its using GPS to to define position and in that - GPS despite advertisement claims ... is actually only accurate to within METRES not cms ... not inches ... average BEST if you run a professional plotter is a circle of 3m. We are extremely lucky that any of our AC land so well and close to original Home points. And the later generation which uses Visual Positioning as well - relies on GPS to get close enough to then be able to use that Visual system. One way to increase accuracy and landing of the P3P - is to switch OFF VPS ... all it does when outside is make the AC 'bounce' and slide when landing that last foot or so. Part is ground effect - but a large part is the VPS. I found that an old doormat works great instead on the light weight commercial landing pads. If I follow exact instructions on precision landing my P4P V 2.0 lands back on this mat usually within a foot or less from the takeoff point. This is using Litchi only. Agreed ... it needs a reasonable weight to resist the downdraft of the props. I used a moderate weight piece of hessian backed carpet - cut to fit in my case over top of the gear ... but that was often lifting as I landed. So I changed to a heavier hessian backed carpet ... works a treat. At home having spare large ceramic floor tiles spare ... i carry a couple out to garden to use those in the snow etc. Hey everyone. Brand new to the forum. Glad to be here. I have a set of collapsible automobile sun shades I tack down with some plastic tent stakes. They're cheap, lightweight, and silver so they contrast well on grass. My Mavic does a better job finding it's home point than my P3S which I attribute to the VPS. However, they both struggle with ground effects when they are a few feet above the landing pad. I find I can land manually far more accurately than depending on the onboard sensors. If I use RTH I usually take command once they are are above the landing site. My P4P v2 usually lands within a foot of take off point, sometimes within 3". The RTH really works well. I just back away and watch it do it's thing. Simple sheet of OSB and emulsion paints. Some small sacks or tennis balls filled with a medium such as sand and fitted with a small clip is a good alternative to the pegs as sometimes your work area may have a solid ground and sometimes the ground is clay based and you are left with the task of handling and transporting dirty pegs, it’s doable but an unnecessary inconvenience and contamination risk. 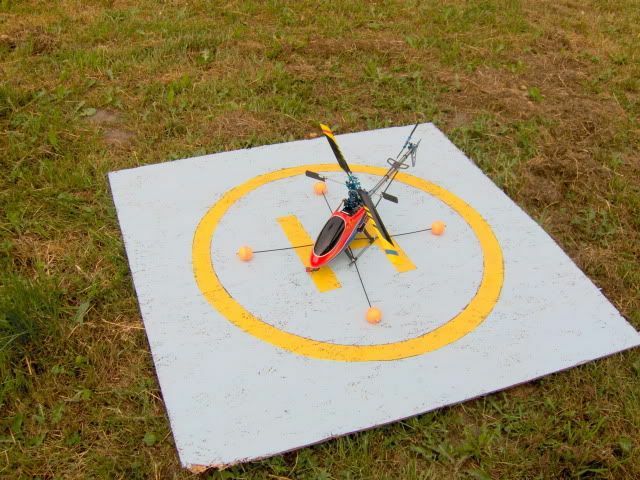 And if u use the pop up variety of landing pad, they are easily transportable and hold themselves taught, reducing the likely hood of air entering beneath them. Not to mention the addition of low grade reflection strips increase the contrast of the visual references. Anytime my P3P comes anywhere within a 10 foot radius of the landing pad, it's a good day. I always land manual. If your takin off from home or a club I guess it doesn’t really matter what u land on I guess. But when using it for fun while travelling or when working, it can help. An old small fold up picnic table designed to throw in the boot of the car is more than enough for a pad .. With or without legs.